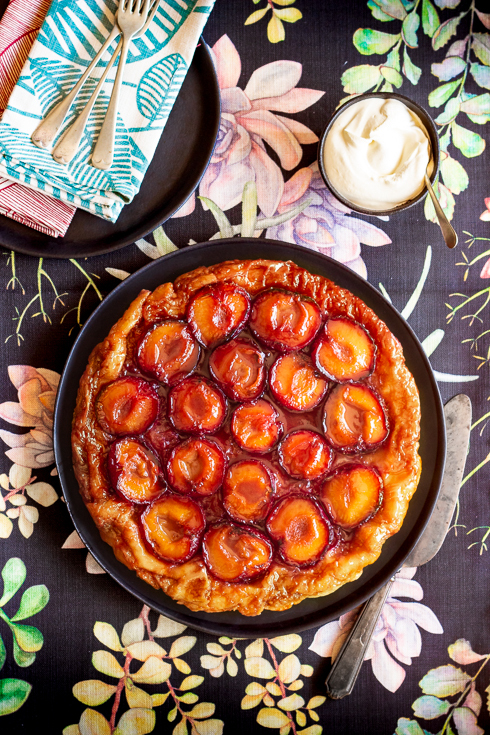 Simple, seasonal plum tarte tatin with creme fraiche. Last week we had a “sibling dinner” at my sister’s place. I am the second oldest of 4 siblings, my sister being a year older and two brothers younger than me (4 years and 6 years younger). Between the four of us, we have 3 kids. Each of us has a partner too. So that makes for a loud, lovely bunch together! My sister and her husband cooked homemade gnocchi with flame grilled steak and mushroom sauce for dinner – just incredible. We’re all huge food lovers and we all love cooking, so no effort is spared. For dessert, my sister asked to help her put a quick tarte tatin together, using some of the last plums of the season left on the trees across the road. I haven’t made a tarte tatin for years, because in June 2015 I had a dangerous mishap in the kitchen while demonstrating a party-size tarte tatin to a crowd: I flipped the bubbling hot caramel pan over using a plate that didn’t quite fit the pan, and the hot caramel landed all over my chest. Needless to say, I still bare the scars. It was a reminder that one should always take time and care while cooking, never to rush things when you’re tired or overworked, and pausing to rethink situations that might be potentially dangerous. Yet, making this simple tarte tatin with my sister again, reminded me of how four simple ingredients can be turned into the most delicious dessert imaginable – so simple, so elegant, so celebratory of the season. Isn’t that what life is about? Pausing, learning, overcoming fears, being present, enjoying life’s simple pleasures. 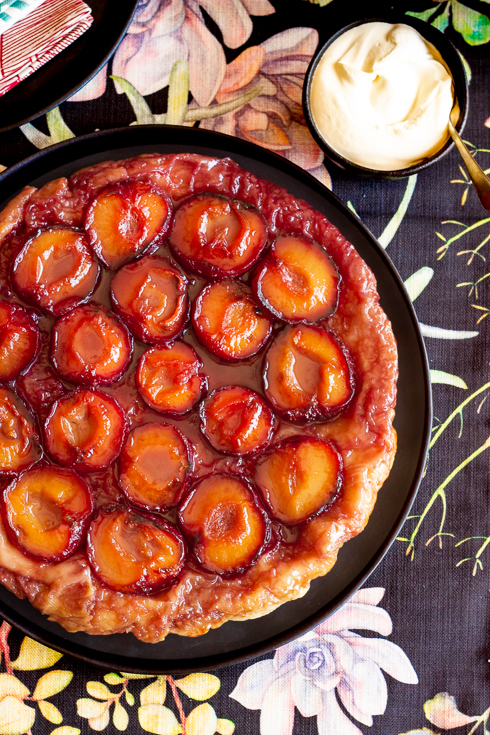 I went home with a bag of freshly picked plums and cooked another plum tarte tatin a day later, wrapping the hot pan and plate in an old towel before carefully flipping it over. A little spillage (not on my skin this time), but so much delight! I’ll be making this tart again and again this year. 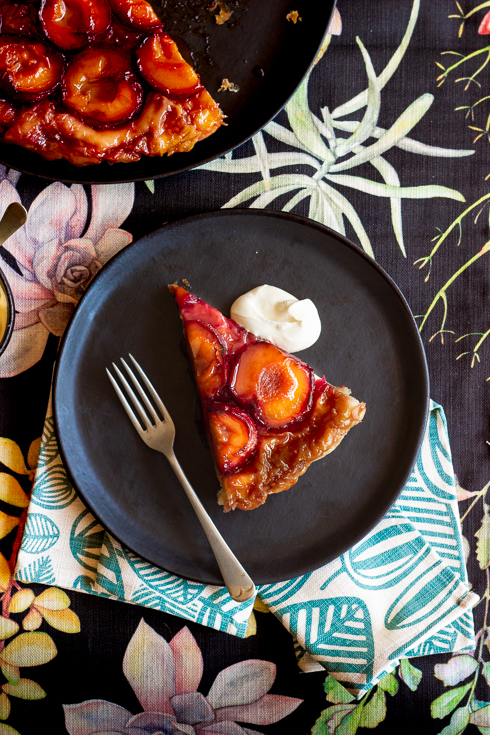 A slice of plum tarte tatin with creme fraiche. Linens from Design Team / Peppertree Bags: Runner – Succulent, charcoal on parchment. Napkin: Stilo – sage on parchment. Using a 23-28 cm wide x 5cm deep round pan that is oven-safe (choose a suitably sized turning-out-plate for your pan before you go ahead with the cooking – test it to see if it fits, and set it aside for later), melt the butter slowly and add the sugar. Bring to a slow boil, then quickly arrange the plum halves tightly in the pan, cut sides down. Turn the heat up, and boil until the sugar and butter for about 5 minutes to form a golden caramel, carefully shaking the pan now and then. Watch it closely and remove from heat to prevent it from boiling over. Remove from heat to cool completely in the pan – about 30 minutes is fine, but can be left longer. Pre-heat oven to 200 C. Roll out puff pastry and cut into a circle that is slightly larger than the pan (cut and paste your sheet of rectangular pastry to first form a square, if necessary). Cover the plums with the pastry, tucking in the edges so that the fruit is contained. Use a sharp knife to cut a few slits for the steam to escape, then bake for 25-30 minutes until golden. Remove from oven, then place a serving dish on top of the pan and carefully turn upside down (work quickly, but be very careful!). Remove the pan. If any fruit has moved out of place, now is the time to carefully put them back in place if necessary. Slice and serve warm, with or without cream / creme fraiche / ice cream. Tip: Only use a tin or a pan that is completely made from metal/iron – plastic handles will melt in the oven. Always remember to use a heat-proof cloth to handle the hot pan. The simplicity of this dish is the key to its success. Crispy pastry soaked with fruity caramel syrup, against soft, sweet and tart fruit. 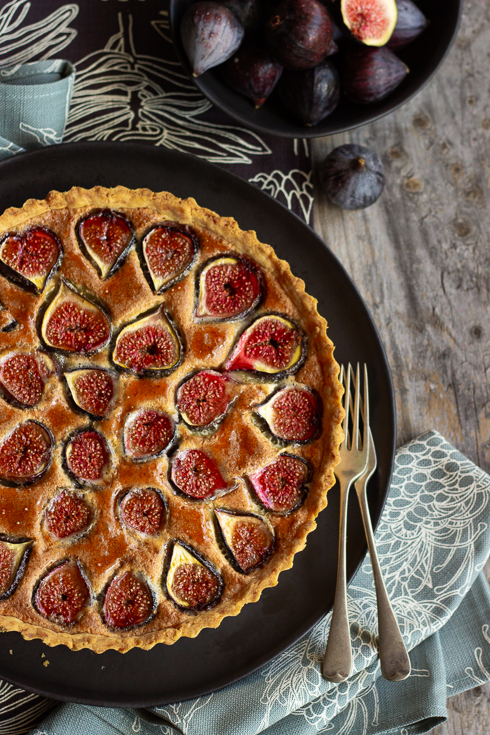 A simple tart using only a few basic pantry ingredients. Soft, buttery and chewey with crisp edges. I am always inspired by recipes that require just a few basic pantry ingredients. In saying that, I also realize that there are so many people who don’t have these basics on hand, not even mentioning a proper oven or a tart tin. But bear with me as I celebrate the tighter winter months as a creative freelancer. This is why I love what I do: I can make delicious stuff out of “we-have-almost-nothing-in-the-cupboard” stuff. 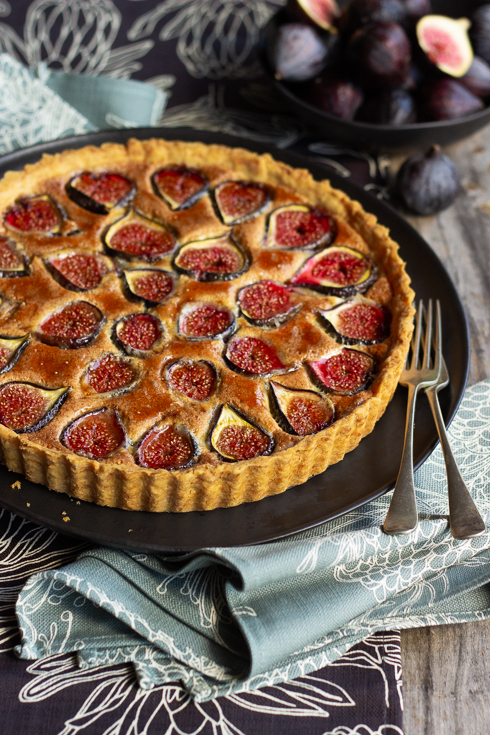 If you have jam, flour, butter and a few other small basics, this tart will bring some sunshine to your wintery world. Although jam crumble squares have been around for a long time, I’ve never tried to bake it in a round tart form. I have to say that it does put a fancy jacket on this humble sweet treat. Serve it with custard or ice cream or whipped cream as a beautiful way to end a dinner. Otherwise, opt for a square tin and cut it into squares for tasty lunch box treats. They’re soft, chewy, crumbly and actually not too sweet. Weirdly, they get better on standing – more gooey and chewy. So resist the urge to gobble it down straight from the oven. I made this batch with some homemade marmalade, seeing that I made a considerable batch at the beginning of winter. My marmalade is quite chunky with long strands of rind, so I heated it up in the microwave and gave it a whizz in my food processor. Otherwise, use any jam you love out of a jar – berry, apricot or even something like caramelized onion for an interesting savoury spin. This recipe was adapted from The Ultimate Snowflake Collection by Heilie Pienaar – one of my trusted baking bibles. Place butter and sugar in a food processor (or bowl with electric whisk) and cream until smooth. Add egg & vanilla and mix until light and creamy. Place flour, baking powder and salt in a mixing bowl and stir well with a whisk. Add it to the creamed mixture and pulse/mix until it comes together as a soft pastry. Turn out on a piece of cling film and refrigerate for 15 minutes. 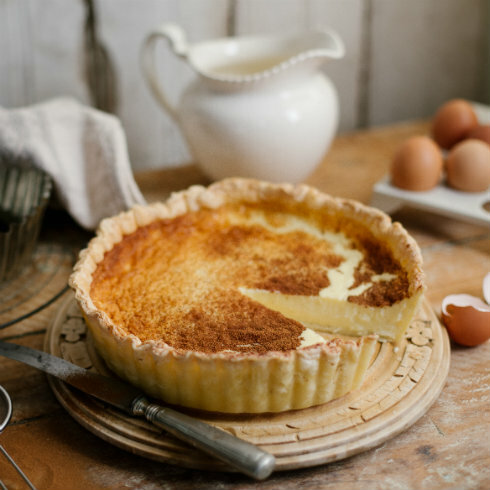 In the meantime, spray a 23 cm fluted loose bottom tart tin with non-stick baking spray or brush with melted butter. Pre-heat oven to 200 C.
Use 2/3 of the pastry and press it into the base of the tin and slightly up the sides – I found that it works well when you wet your fingers lightly with water to prevent sticking. Prick the pastry with a fork, then place a sheet of non-stick baking paper on top. Top with dry beans or rice and bake blind for 10 minutes. Remove from the oven and remove the beans/rice and paper. Lower the temperature to 180 C. Add the jam and spread evenly over the tart base with the back of a spoon – you need quite a thick layer as it will sink into the pasty when baked. Remove the remaining pastry from the fridge/freezer and use a grater to coarsely grated the pastry over the jam layer. Neaten it up slightly, then bake for 25-30 minutes until golden brown and crisp on the edges. Leave to cool for 30 minutes before cutting and serving. If serving warm, serve plated with custard/cream/ice cream. If serving cool, it can be eaten by hand. Step 4: Press 2/3 of the pastry into a greased 23 cm tart tin. Step 5: Spread the blind-baked pastry with jam. Optional: Dust with icing sugar when cool. Serve and slice at room temperature. The entrance to Stellenbosch Kitchen on Andringa Street, early evening. This year, I’ll be celebrating my 40th year in Stellenbosch. A year ago we made a move from the outskirts of town to the beautiful bustling historical centre. While we gave up a chunk of living space (in size) in the process, we gained the incredible European-like lifestyle of locking up our apartment and walking a short distance to the best coffee shops and restaurants the Winelands has to offer. Dorp Street and Church Street is where it’s at: the centre of my beautiful town when it comes to tourism, social hotspots, food and wine. Right in the middle of it all is Stellenbosch Hotel and its recently renovated restaurant Stellenbosch Kitchen – pretty much back to back with its sister-hotel Coopmanhuijs Hotel & Spa featuring Helena’s Restaurant. I recently had the opportunity to visit Stellenbosch Kitchen for dinner and lunch respectively, and would love to share my experiences with you. The landmark veranda of Stellenbosch Kitchen on Andringa Street, early evening, just before the arrival of dinner guests. Stellenbosch Hotel is one of the oldest hotels in town, built on Simon van der Stel’s property (a grant) between 1692 and 1701. It has since been restored in 1987 and declared a national monument. 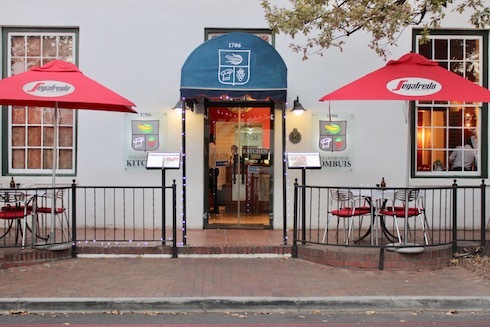 After the refurbishment in 2016, the name Jan Cats Restaurant was replaced by Stellenbosch Kitchen, featuring an eclectic yet contemporary spin on the existing historical eatery. The space that is now called Stellenbosch Kitchen has forever been a local hotspot to both students, the mid-town working crowd and the wealthy. 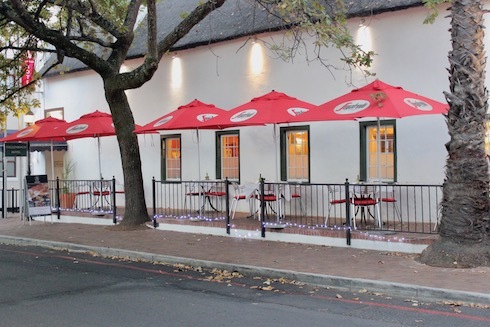 Their bistro-style fare has been a favourite for decades, being enjoyed on the tree-rich veranda that envelopes their landmark corner on Dorp and Andringa streets. Here are my lunch and dinner experiences in pictures. 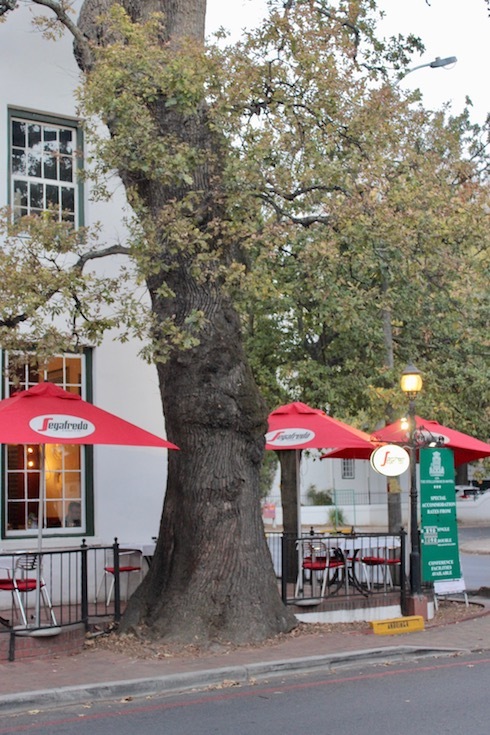 One of the massive old oak trees that surround Stellenbosch Hotel. Our 18h00 arrival at Stellenbosch Kitchen meets a neatly prepped restaurant space. 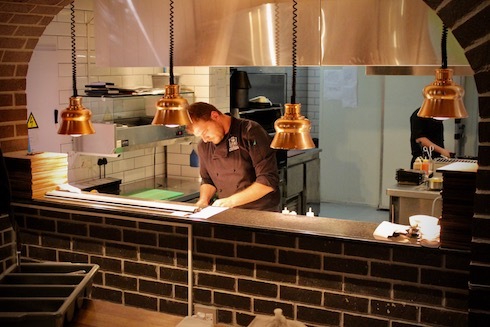 Chef at work – the service hatch at Stellenbosch Kitchen. 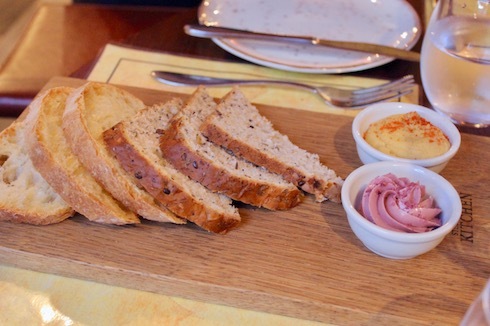 Bread board with red wine butter and hummus. All bread baked in-house. 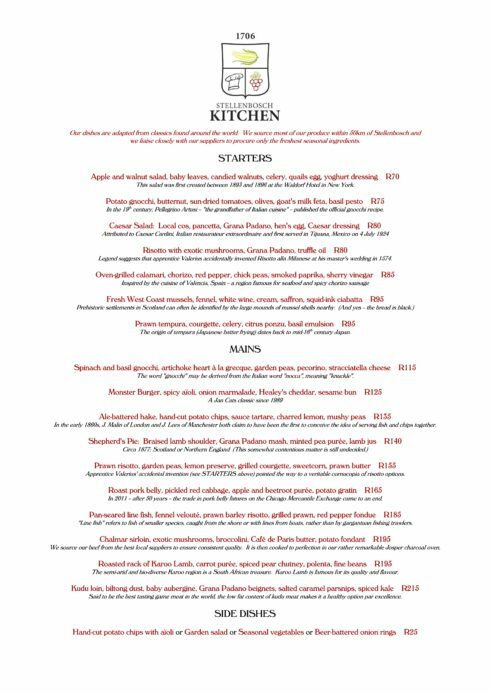 The dinner menu at Stellenbosch Kitchen. This menu changes seasonally. 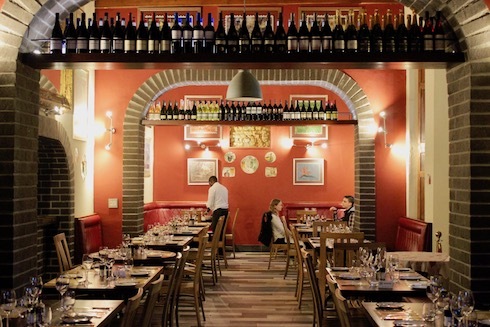 An exceptional wine list is one of the attractions at Stellenbosch Kitchen. 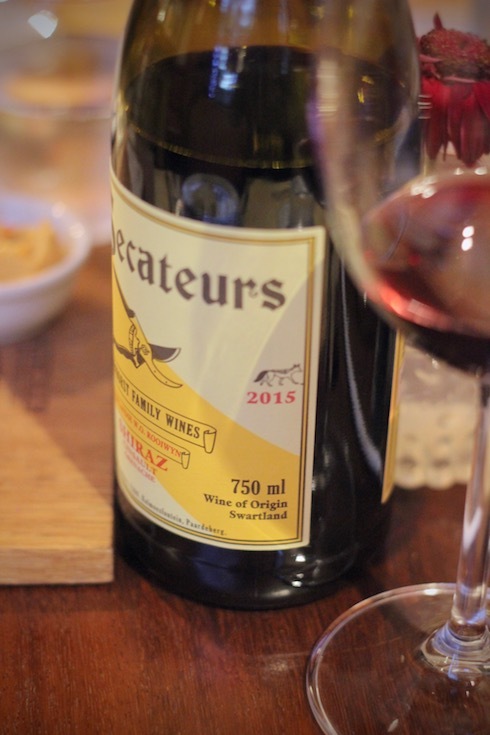 Here we’re enjoying Adi Badenhorst’s Secateurs Shiraz. Potato gnocchi, butternut, sun-dried tomatoes, olives, goat’s milk feta, basil pesto. 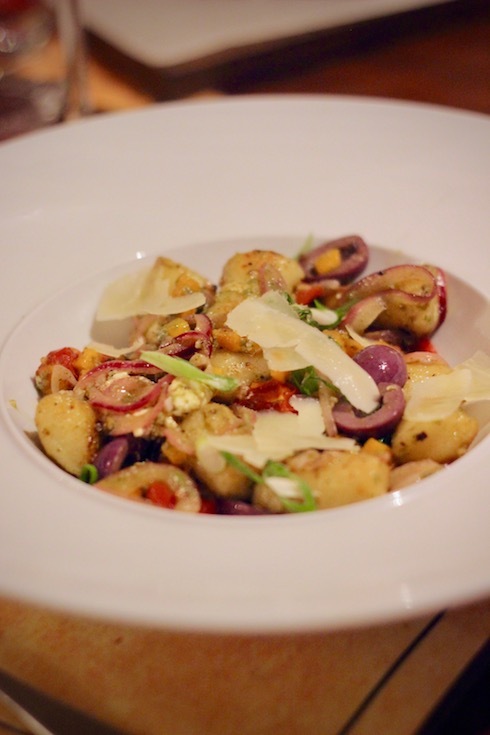 Beautifully cooked gnocchi with a mixture of very punchy ingredients. 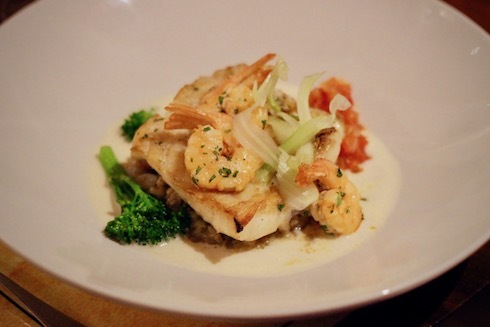 Pan-seared line fish, fennel velouté, prawn barley risotto, grilled prawn, red pepper fondue. Perfectly cooked line fish, and I really enjoyed the texture of the barley risotto. 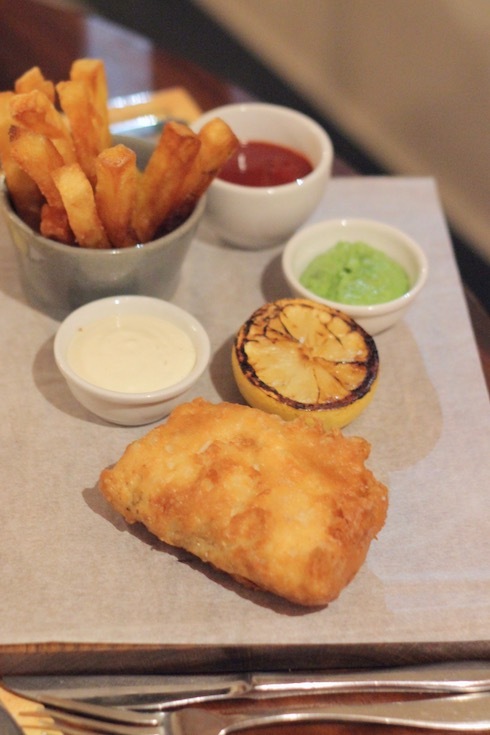 Ale-battered hake, hand-cut potato chips, sauce tartare, charred lemon, mushy peas. A stunning dish, yet so simple. Perfect tartare, fluffy hake, super crunchy chips – what more do you want? 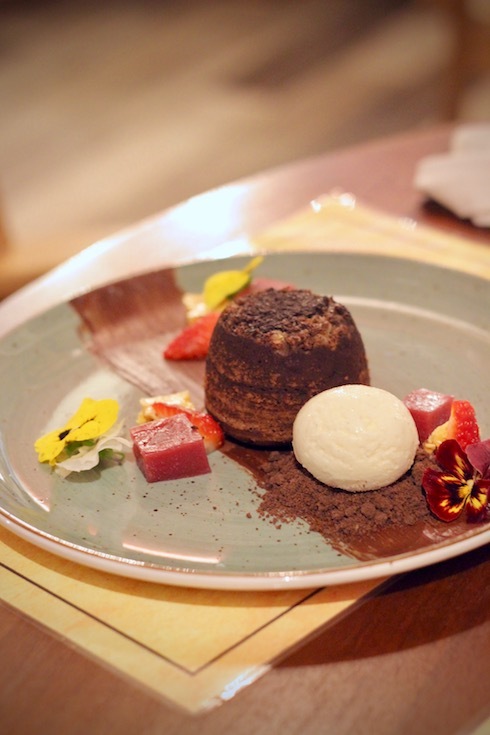 Fondant of black cherry and Valrhona chocolate, Bulgarian yoghurt ice cream. Excellent texture and an interesting spin on the classic fondant – maybe a little too bitter and sour for my personal preference. Beautiful plating and delicious ice cream. Our second visit was an early lunch at 11h30 – also much better lighting by day for my camera! 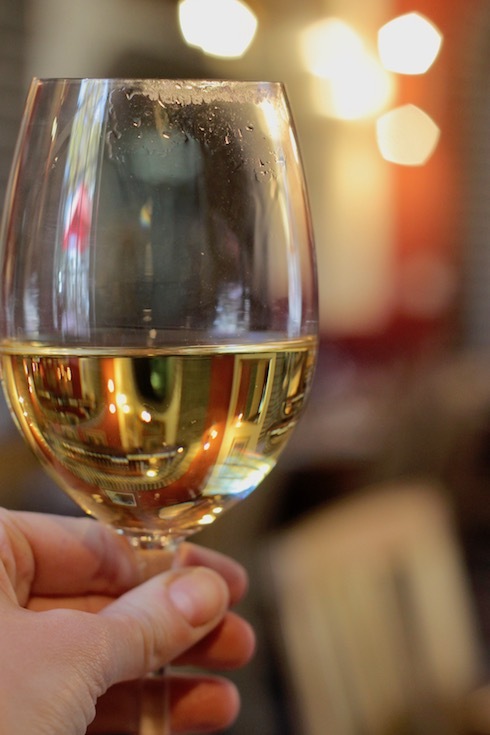 A buttery yellow glass of Jordan Chardonnay for me. 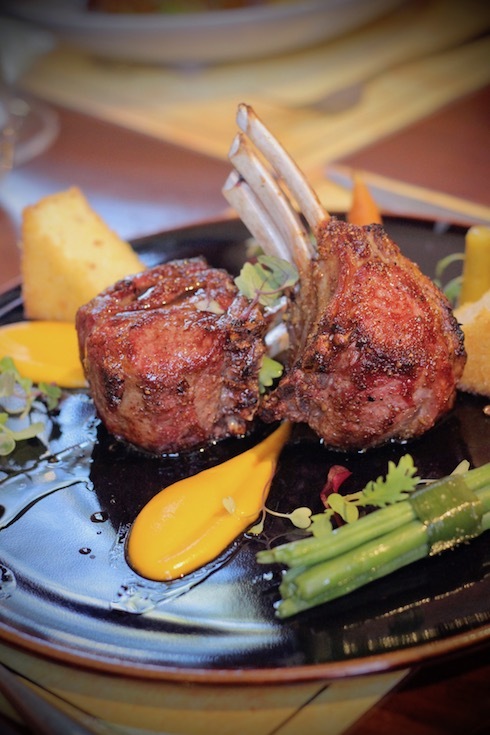 Roasted rack of Karoo Lamb, carrot purée, spiced pear chutney, polenta, fine beans. This dish is from the dinner menu, but was made for us on special request over lunch. It is one of the most popular dishes on the menu and well worth ordering (for dinner). 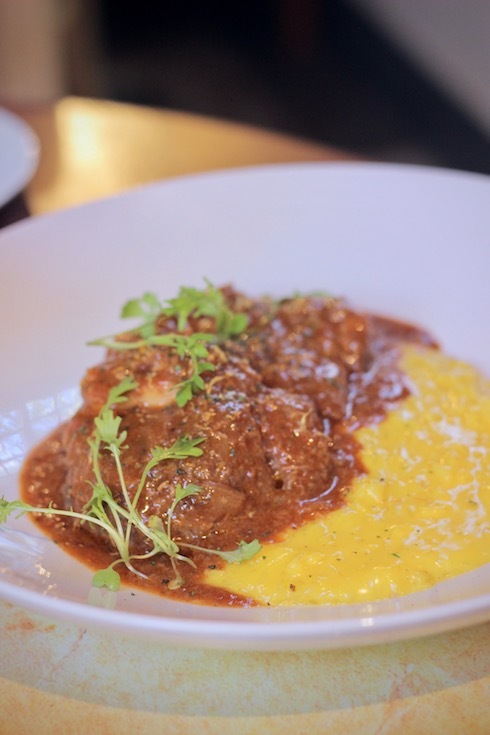 Osso bucco with risotto milanese. This dish certainly won’t win any prizes for plating, but it is hearty and moorish and hits all the right spots for comforting winter fare. 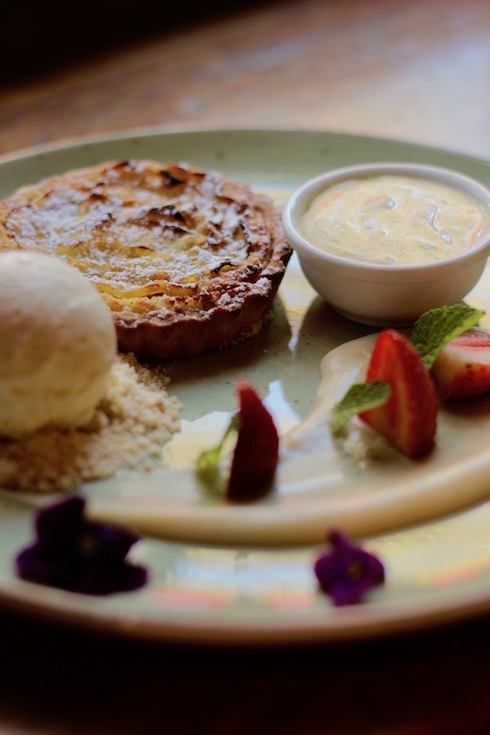 Apple and almond tart, vanilla bean ice cream, ginger crumble, crème anglaise – definitely my favourite dessert on the menu. They should serve this delicious pastry for breakfast too! 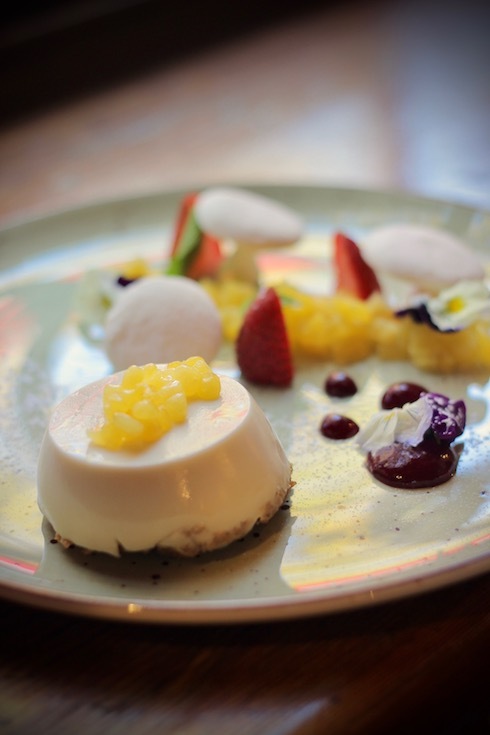 Coconut panna cotta, compressed pineapple, mango caviar, passion fruit mushrooms. 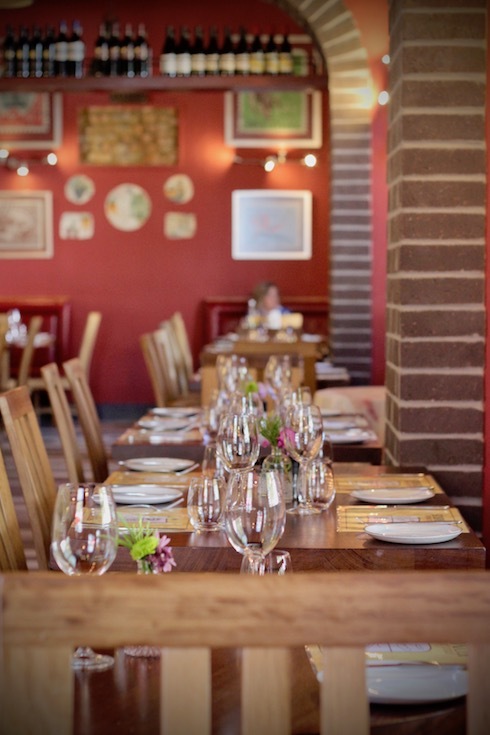 Stellenbosch Kitchen is well worth a regular visit, whether for a mid-week lunch, a lazy weekend dinner, or a special occasion with friends from abroad. Thank you to the staff and management of Stellenbosch Kitchen for hosting us. We’ll certainly be back for more. 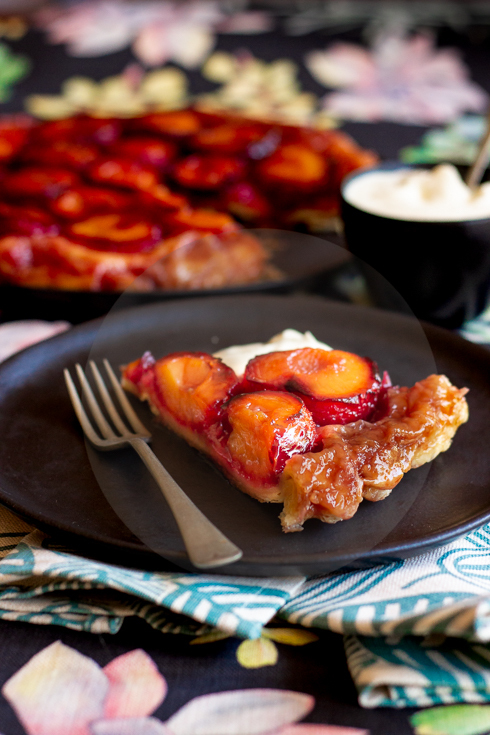 A few years ago I posted this recipe for a peach galette. By the way, the French call it a galette, the Italians call it a crostata. Now that I’ve given all the credit to the French previously, I suppose it’s time to give the Italians a turn. 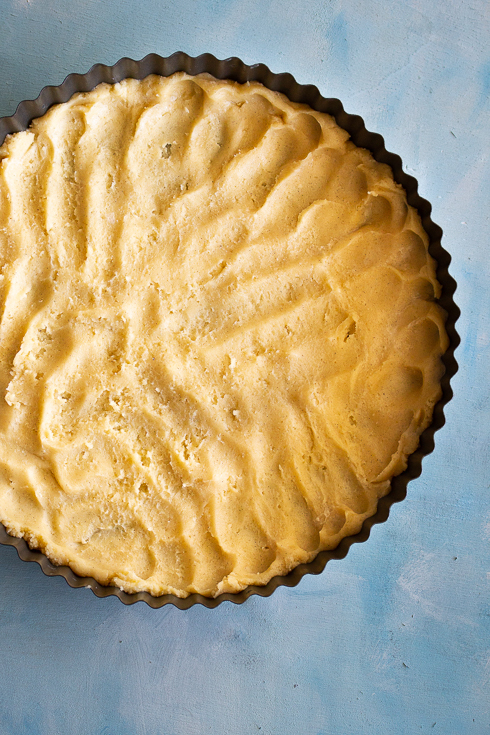 Since the first time that I made this rustic free-form tart, it has become my secret weapon. I’ve made it numerous times with cling peaches, sometimes with nectarines and once with plums. 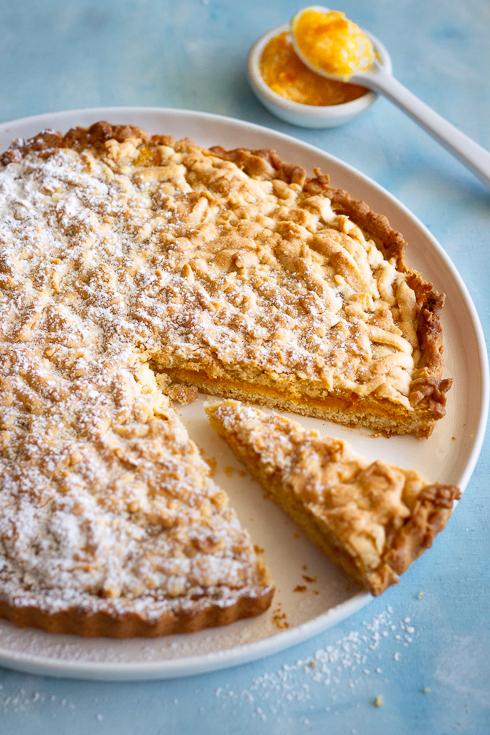 Every single time the result has been magnificent: buttery, flaky pastry enveloping an oozing almond paste centre along with slightly tart and soft fruit on top. It’s a revelation to many who taste it the first time. The simplicity and intensity of it all is just superb. And can you imagine adding a dollop of creme fraiche or vanilla ice cream? The stuff dreams are made of, literally. For the almond paste: Place all the ingredients except the egg white in a food processor. Add half the egg white and process until it comes together into a ball (add more egg white until you get to the desired consistency, add more icing sugar if your mixture is too sticky). Remove from the bowl, cover with plastic wrap and freeze for at least 3 hours. It won’t ever freeze solid because of the sugar content, but it is much easier to handle when it is hard enough to grate. For the pastry: Place the flour, sugar, salt and butter in a food processor. Pulse until it resembles breadcrumbs, then add the icy water all at once while the motor is running. As soon as the dough starts to come together, remove it from the bowl onto a lightly floured surface. Press into a disk shape, then cover with plastic wrap and refrigerate for at least 30 minutes to firm up. To assemble: Pre-heat oven to 220 C. Roll out the pastry on a floured surface to a thickness of about 5 mm. Transfer carefully onto a large baking tray lined with baking paper. Brush the top of the pastry with egg, leaving a 3cm border around the edges. 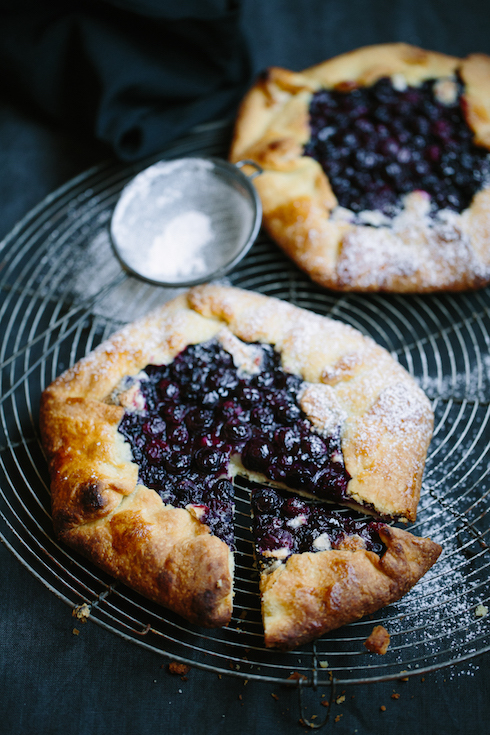 Coarsely grate the frozen almond paste all over the brushed egg pastry surface, then cover with blueberries. Fold the edges over carefully, keeping the look of the edges rustic. Bake for 25 minutes or until golden brown. Remove from oven and cool on a wire rack before serving with vanilla ice cream (serve hot or at room temperature). There is nothing more beautiful than a perfectly ripe plum, its silky matt skin dark and red and tender. Inside, the flesh reveals a golden, juicy, tart, fibrous treasure. I could stare at plums for hours – such astonishingly pretty fruit. 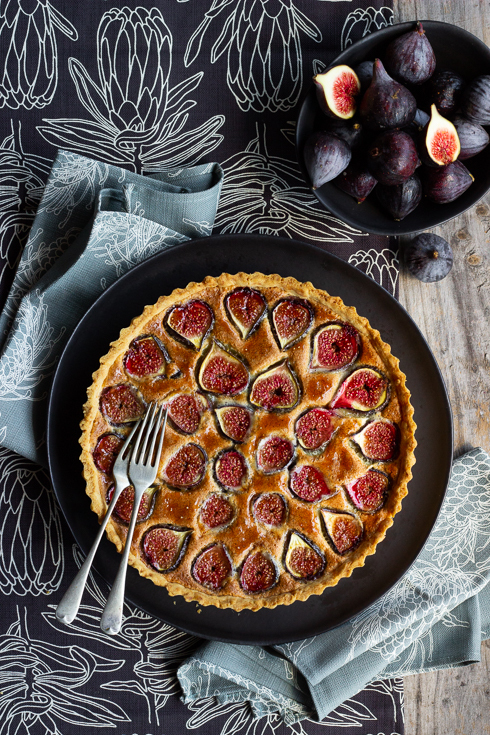 This simple tart is easy to make and – with its rustic charm – a dream to look at. The roasted fruit needs some time to cool, so don’t be rushed. Note: This tart also looks beautiful when assembled in smaller jars. Just substitute the baked pastry for buttery cookie crumbs (200g digestive or tennis biscuits mixed with 80 g melted butter). Just spoon the crumbs into individual 250 ml capacity jars without compressing it. 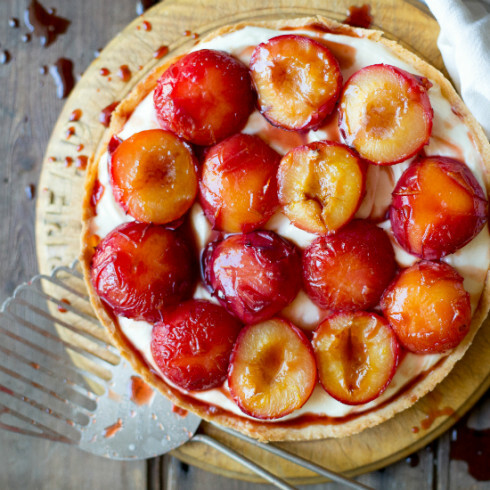 Top with the creamy filling & roasted plums, then refrigerate. Mobile desserts fit for a royal picnic. To make the pastry: Place the flour, butter & sugar in a food processor. Pulse until it resembles fine breadcrumbs. Add the yolk and pulse again. Now add the iced water and process until it starts to come together in a ball. As soon as it does, remove from the processor, then knead briefly to form a smooth ball. Shape into a disc, cover with cling wrap and refrigerate for 30 minutes. Roll out on a lightly floured surface (about 0,5 cm thick). Transfer to a greased tart tin (about 20-23 cm diameter), then press gently into the corners and trim the top. Line with baking paper, then fill with dry beans or rice. Pre-heat oven to 200 C, then bake for 15 minutes. Remove paper and beans, then bake for another 5-10 minutes until golden. Remove from oven and leave to cool. To make the roasted plums: Place halved plums on a baking tray (alternate cut-side up and down), then sprinkle with sugar & drizzle with orange juice. Bake at 200 C for 15-20 minutes, then remove and leave to cool. Note: you want the plums to be tender, but not too soft – they must still be in tact. To make the filling: Using electric beaters, beat the condensed milk with the lemon juice until smooth. Add the cream cheese, then beat until well mixed. Pour into the prepared cooled pastry case, then refrigerate for at least 1 hour before serving. When ready to serve, top with cooled roasted plums, then slice and serve. 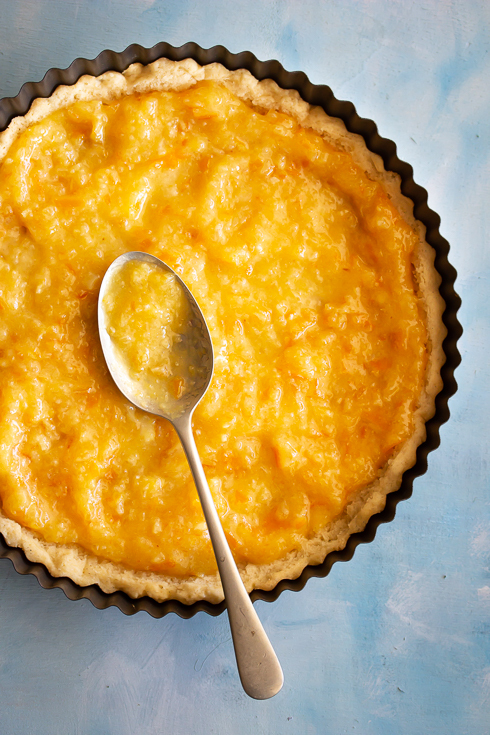 Note: This assembled tart can be refrigerated and enjoyed within 2 days. The pastry will however be best served on the first day. This post was originally written for The Pretty Blog. Back in the heydays of Nook Eatery, my favourite daytime hangout in Stellenbosch a few years ago, their pear and almond tart was one of my ultimate pastries to enjoy with a strong cup of fresh coffee. Unfortunately, Nook doesn’t exist anymore. Jessica and Luke moved to Greyton, and they started a new venture called A Good Place To Gather. Jessica is a very talented pastry chef, and all of her pastries at Nook were just impeccable. You could see that she naturally understood the magical science of flour, butter and eggs. Jessica admits that her pear and almond tarts are “not quick to make”, but that the result is well worth the effort. 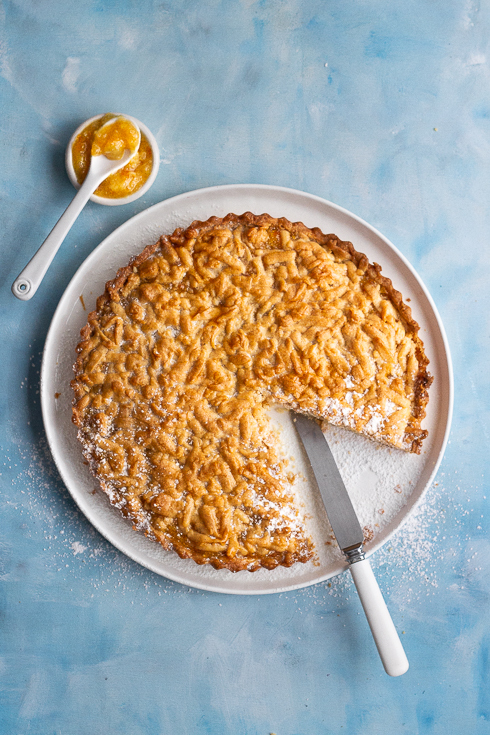 Although nothing in the world would make me happier than to spend a whole day blissfully baking the perfect pear tart, not everyone is a naturally talented pastry chef, and not everyone has a full day to spend on poaching pears, making and resting pastry, and creating a perfectly smooth pastry creme. So I searched for a recipe that has less effort, but still delivered a really great result. I found one in my brand new Donna Hay book, Seasons. 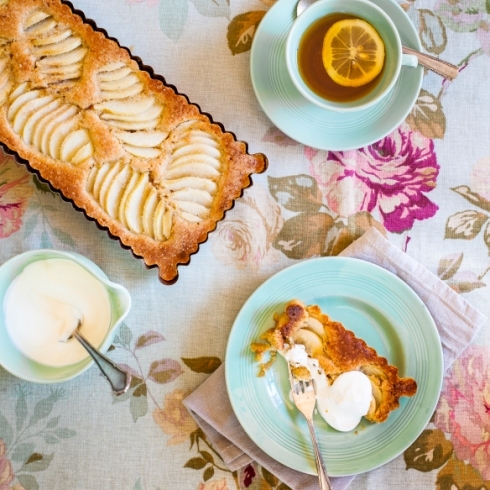 It is a rustic pear and almond tart, without a separate pastry base, made with fresh pears. Donna has a reputation for writing really simple recipes that work, without compromising on flavour. Place the butter and the sugar in a food processor, and process until combined. Add the eggs, almonds, flour, baking powder and lemon rind. Process until just combined. Spoon the mixture into the greased tart tin, and spread it out evenly into all the corners. Place the sliced pears on top of the mixture, then press it in slightly to fan it out. Sprinkle liberally with brown sugar, then bake for 40 minutes at 160 C.
Remove from the oven, then cool for 10 minutes before serving with thick cream. This post was written especially for The Pretty Blog.